Even just a drop of whisky, liqueur, champagne or wine will become a big pleasure with our crystal tumblers and glasses. Traditional rich hand-cut decoration is a great choice. You will discover the absolute purity, sparkling beauty and high quality in every piece you buy. So you choose. Our wide range of crystal tumblers and glasses is just waiting only for you. 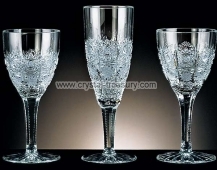 Our crystal collection includes large and small wine glasses, champagne saucers and flutes, sherry, liqueur and beer glasses, Hi-ball and DOF Old Fashion tumblers. 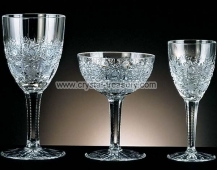 We only carry genuine hand-cut Bohemian crystal, manufactured exclusively in the Czech Republic. We have most of the items in stock at all times, so we can guarantee short delivery terms. And yes, we do ship worldwide.